NOTE: I’m linking to MySpace when it’s available because of the ease of listening to songs, not because of a love of MySpace. ***Click on the band names to LISTEN for FREE! Overall, I liked this one. However, nothing grabbed me and demanded a second listen. Honestly, the best part of this one is my lovely friend Erin wanted to know why I chose this record (I already own it). Apparently I’ll be listening to all other records from Okkervill River because this band is Erin’s Old 97s. Thank god someone else has a deep admiration for a band besides me. Not to this one any time soon. I’ll be too busy checking out all their other records. Can’t wait! Basically all the other songs are cocktail sounds that make me feel very Continental. It makes me want to put on my best MadMen outfit and drink cocktails. It’s so not my type, and yet it totally rocks. Hey Eugene is like a brain worm. It gets in and plays itself over and over. In a good way. It also sounds NOTHING like any other song on the album, so don’t judge the record by that song. I got nuthin. It’s just so needing more than a couple of listens. So out of my music realm at this point, it’s not instantly a must listen. Maybe. I need to branch out, I’ve got it, so maybe. I don’t even remember listening to it. I do remember J-man telling me that I probably won’t like it. Upon a second listen, I’m still thinking it’s not really my style. I wouldn’t turn it off if someone played it, but I doubt I’ll be the one playing it. I’m starting to realize one of the shortcomings of this project. Listening once or twice for some recordings, just isn’t enough. Especially if a record is out of your comfort zone. Maybe next time I’ll do one a week and spend a whole week listening to one record so I can really give my thoughts after spending some more time to appreciate each one. Yes, without a doubt. It’s a classic road trip sing along. This is one of the first “alt-country” records I loved and it continues to bring a smile to my face with every listen. It totally reminds me of the Juno Soundtrack and I have that too. It’s cute, sisterly sing songy, maybe if I put a couple songs into a mix. As an album? Probably not. Roomful of Smoke – country music at its finest. Someone should write a movie to go with this song. Just sayin. Old Times – by the chorus I was checking the liner notes to see who was behind all these classic songs. LATB wrote and perform their own music. Winter Fugue – Leslie sounds very Dolly Parton-esque on this on. In such a good way. I LOVE THIS SONG! My Tears Are Wasted On You – perfection. Every song offers some sort of brilliance.Will I listen again? Everyone should be listening to this one. Seriously, buy it and then go see LATB when they come to your town. Blame Rhett Miller. He’s the one that had them open the show last weekend at the Independent. *** If you click on the band name, you can listen to a few songs for FREE that the band has on their MySpace pages. That way you can actually take a listen and then go buy some new music. This entry was posted in A Yoga+Music365 Project, Music, Music Round Up! 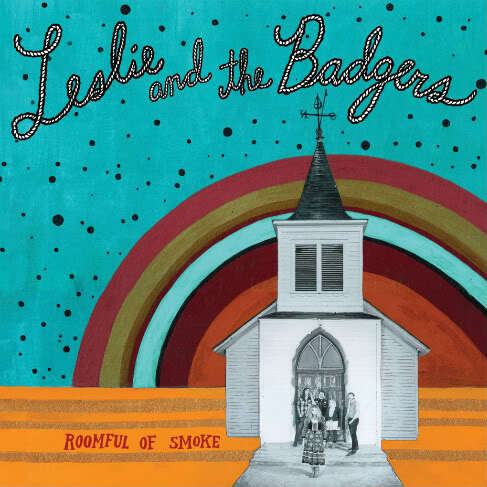 and tagged Leslie and the Badgers, Music by Teacher Goes Back to School. Bookmark the permalink. This is an interesting little project you are taking on here. You are right about not being able to listen to an album once or twice for one day and drawing a conclusion just from that, sometimes it just doesn’t work. Check out our site, maybe you can find something else you like. @unlimitedjuice – thanks for stopping by and for the recommendations. i’ll definitely take a look at your site. i’ve got the m. ward on deck and i’ll definitely check out grizzly bear. total agreement about this project being a bit ambitious. sometimes it’s overwelming. live and learn, huh?